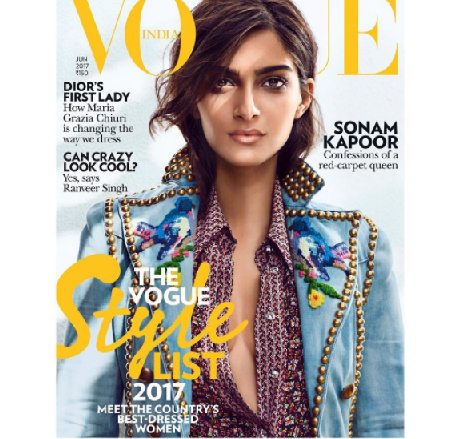 Sonam Kapoor is the latest cover girl for Vogue India and she is looking stunning. Busy actress has recently returned from Cannes and she shared “Fashion is the armor to survive the reality of everyday life.” — Bill Cunningham in her Instagram account. She shared her cover photo thrice on Instagram with one caption as “I have always believed that fashion was not only to make women more beautiful but also to reassure them, give them confidence.” — Yves Saint Laurent. “Fashion is the armor to survive the reality of everyday life.” — Bill Cunningham Wearing: Gucci (@gucci) Styled by: Anaita Shroff (@anaitashroffadajania) Photographed by: Signe Vilstrup (@signe_vilstrup) Hair: Gabriel Georgiou (@georgiougabriel) Make-up: @subbu28 To read more link in bio!